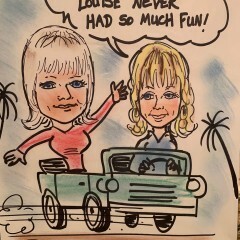 Caricature drawings done of guests at all types of private, corporate parties and events. 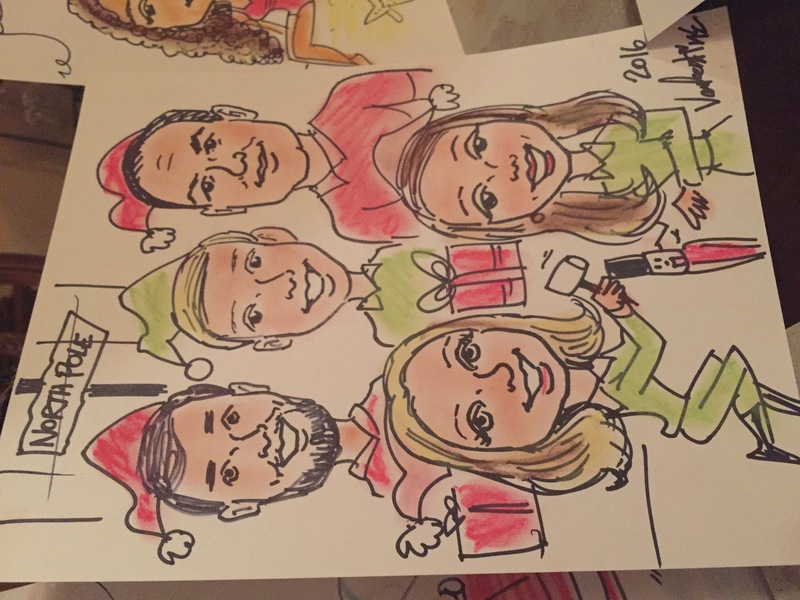 Currently in addition to working all types of events, Mike is a caricature artist at several Disney World locations in the Orlando, FL area. He is also a balloon twister and face painter. Mike also is a master Silhouette artist. Mike was awesome!!! Everyone enjoyed their pictures. So thankful he allowed extra time for everyone to have a turn. Mike Valentine showed up on time and got right to work. He was fast and the sketches were so much fun. I would definitely recommend him for future events both corporate and personal. Mike Valentine was a hit at our 30th Wedding Anniversary! 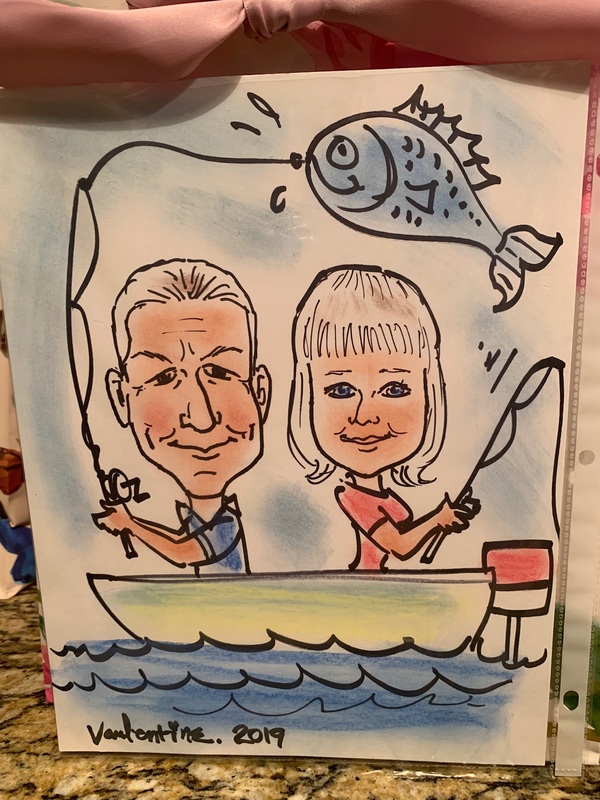 My husband and I, as well as all of our guests, were rather pleased with the Caricature Artist service that Mike Valentine provided at our recent 30th Wedding Anniversary celebration. At first we contemplated hiring him for an hour as we were uncertain how our guests would respond to this type of activity. We ended up having him for three hours!! Everyone stood in line patiently for their turn and were rather pleased with their drawings. We strongly recommend Mike Valentine to add a little life to your next celebration. 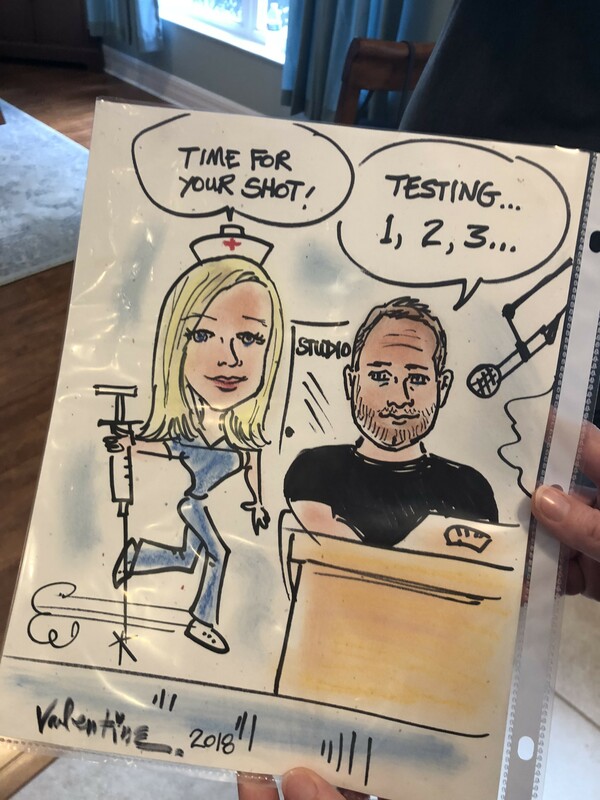 His portraits were not only fun and entertaining but they also added creative flair to our event. Hats off to Mike and his lovely wife for a wonderful job! Thank you. It was a wonderful event! Very nice family and guests. I'm glad they enjoyed themselves. I had a great time. Our guests thoroughly enjoyed Mike Valentine's work. We were vey happy. A pleasure to work with. Great communication. Thank you. The guests were very nice. I had a great time! Thank you. And congratulations . What a nice fun group of guests. God Bless. I had a great time! Mike did an awesome job! 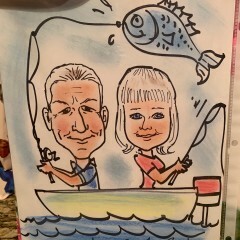 Guests enjoyed getting their pictures drawn and Mike did a great job incorporating their hobbies into the pictures! Would definitely recommend him for your event! I hired Mike for my wedding reception and he was absolutely wonderful! All my guests really enjoyed having him there! I was honored he took the job, considering it was his birthday the day of my wedding. I highly recommend him and will most definitely use him again! Thank you very much! It was a great wedding and everyone was so nice. I really enjoyed it. Congratulations to you both. Thank you, Dorinda. It was a very nice group of people. Glad they enjoyed it. Thank you for having me there. We were so incredibly happy with Mike V! 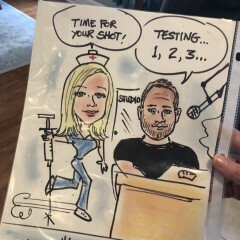 We had just been to an event a few weeks prior with another caricature artist and Mike’s work was exponentially better! We were so happy with it, and our guests were thrilled. It was the best wedding favors and well well worth the price! Thank you so much to Mike V and his wife for their contribution to our perfect day! Mr. Mike was amazing. All our students and parents loved his drawings. Thank you! Thank you, Amicka! Everyone was very nice! Thank you again. Thank you for having me there.Very nice family! Everyone was great! Guests enjoyed him during my wedding cocktail hour. It was just the right touch to my event. So happy I hired him you will not be disappointed. Thank you very much. Congratulations ! Thank you. It was a pleasure.And congratulations on your wedding! Prior to the event there was good communication between Mike and I. He arrived early for the event to set up. He was a BIG hit at the wedding. 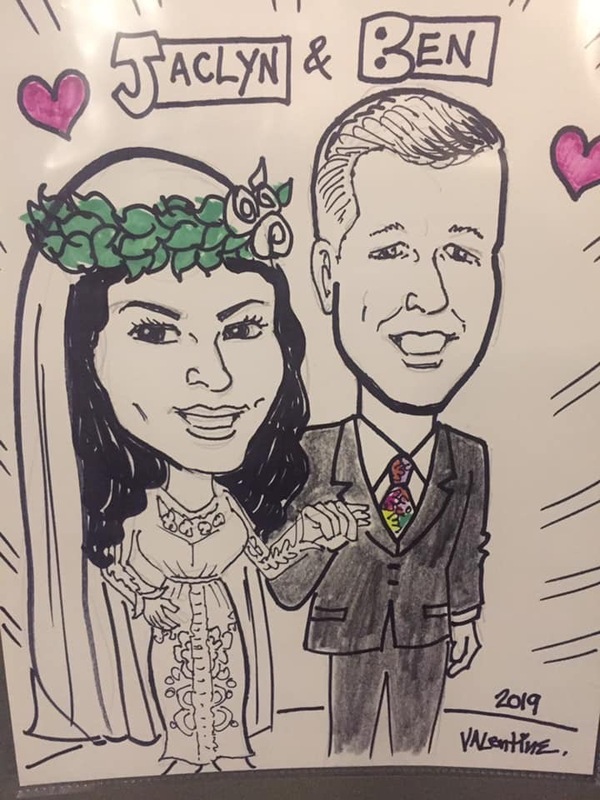 All the guests loved him and loved their souvenir caricature keepsakes. 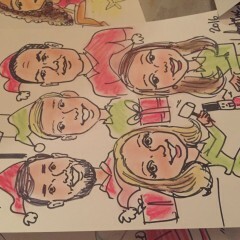 He was very spot on with his drawings and captured everyone’s personalities perfectly!! 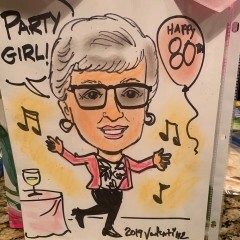 I would highly recommend Mike Valentine as a caricature artist for your next event!! He’s very talented!! Thank you very much! It was a great wedding and wonderful people. Best wishes, Mike Valentine. Mike was a hit! He was very kind and a true artist. Thank you! It was a great party, and very nice guests. Best wishes, Mike V.
Mike did a great job and is very kind and personable. His drawings were very kind to us ladies of “a certain age”! Mike is a talented, and very humble artist. Short for words, but big on delivery. Thank you Mike! Thank you for having me. Again, congratulations! Mike was great and a big hit at the party. 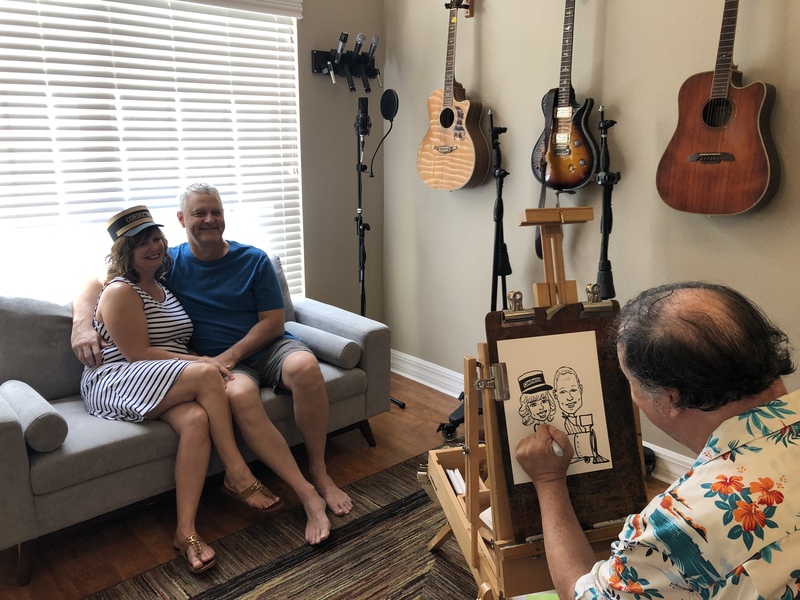 He was on time and even stayed a little late to get some last minute caricatures done for a few guests. He was very kind and patient with the kids. I would definitely recommend him for your event! 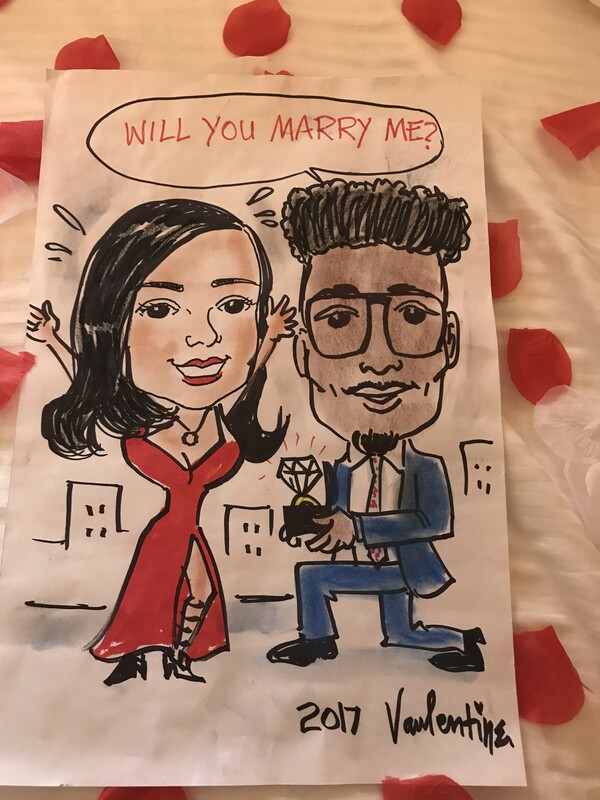 Mike was patient and flexible with the event because it was a surprise proposal for my Girlfriend and he was willing to set up where he needed to in order to facilitate the surprise. 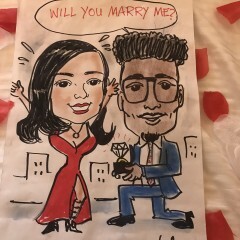 He was very professional and the drawing he did of me proposing to my girl was amazing! 5+ stars!!! Mike Valentine is an amazing artist! We hired him for our Christmas Party and our guests loved his work! Mike communicated with us prior to the event to verify details and was on- time and very professional. You will be pleased with his accuracy, creativity and attention to detail in his work. Thank you Mike for helping to make our party a success! Thank you, Shari. It was a pleasure. 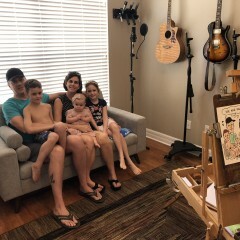 Very nice family, and guests. Search no further, Mike is the BEST! We had a Jack and Jill Party for my son and future daughter-in-law. 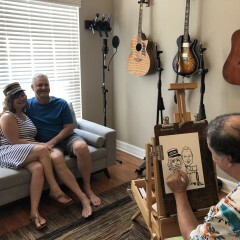 Mike arrived on time, was extremely professional and people loved his caricatures! From the very young to the older people, there was always a line of people waiting! He was fast and right on with the caricatures. Look no further if you are looking for the best at a very reasonable price. 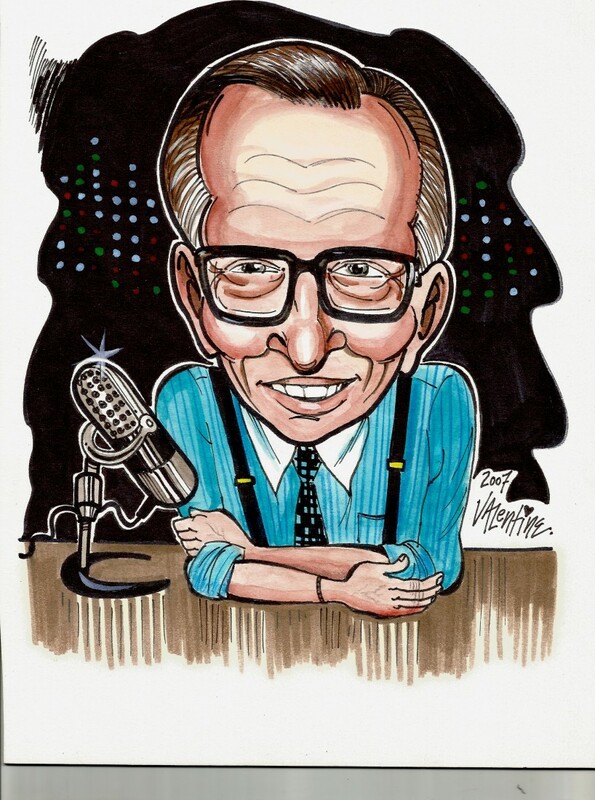 When the time arrives, that I need a caricaturist again, it will be straight to Mike, no searching. Thank you Mike for your contribution in making the party a HUGE success. 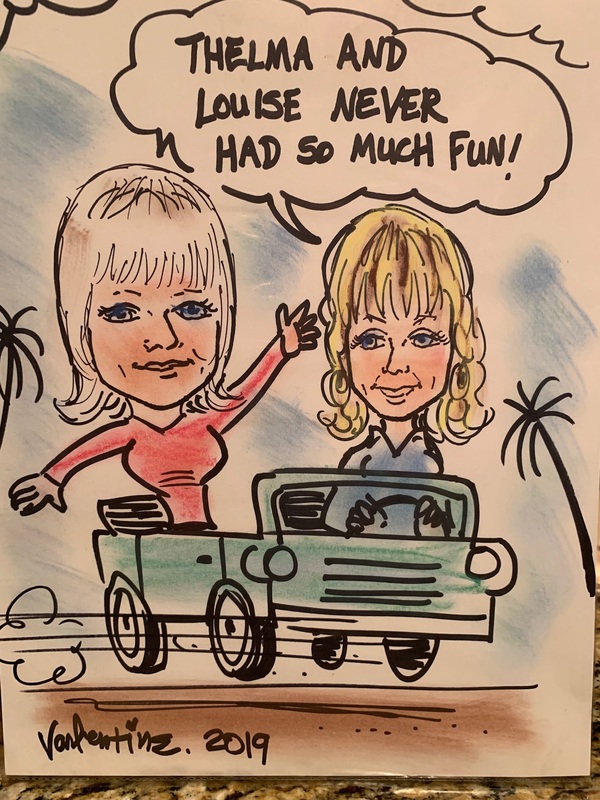 You will get a lot more business, especially with everyone posting their caricatures on Facebook and the positive comments people are posting. Everyone wants to know who you are! Thank you very much, Linda! It was a pleasure, and the guests were great ! Wonderful party! Mr Valentine was very professional, ponctual and contributed to make the party a succes. It was fun and the job was well done. Thanks a bunch for making my sister's baby shower a delightful evening. Mike Valentine was absolutely fantastic! The drawings were top notch. 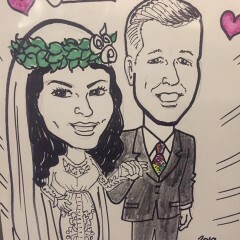 All our guests loved the pictures as favors for the Communion. Everyone was so happy with their drawings. Mike did a special Communion picture for our daughter. I can not say enough wonderful things about how great Mike and his drawings were. Thank you Mike for making my daughter's special day even more special with your expertise. Thank you, Donna. I had a great time, and all the children were so nice. You have beautiful daughters. Thanks for having me there. All the best, Mike V.
Mike Valentine's work is wonderful! His precise artistry makes his caricatures whimsical as well as replicas of the person he is sketching. He was a very easy going person. Our guests loved his work and thought that he was an exceptional artist. He definitely showed his mastery at our sons party! I would recommend Mike to all! Thank you again Mike! 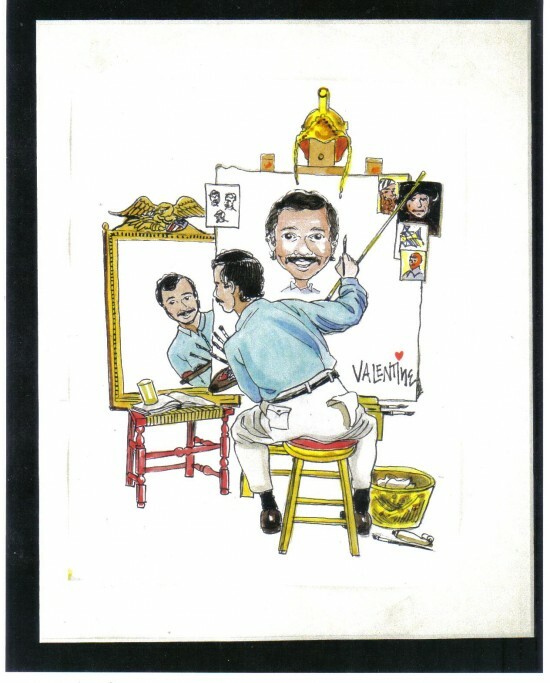 Mike Valentine has been entertaining audiences with his wonderful caricatures for 38 years. A full-time artist, Mike does many events throughout the tri-state metropolitan area. 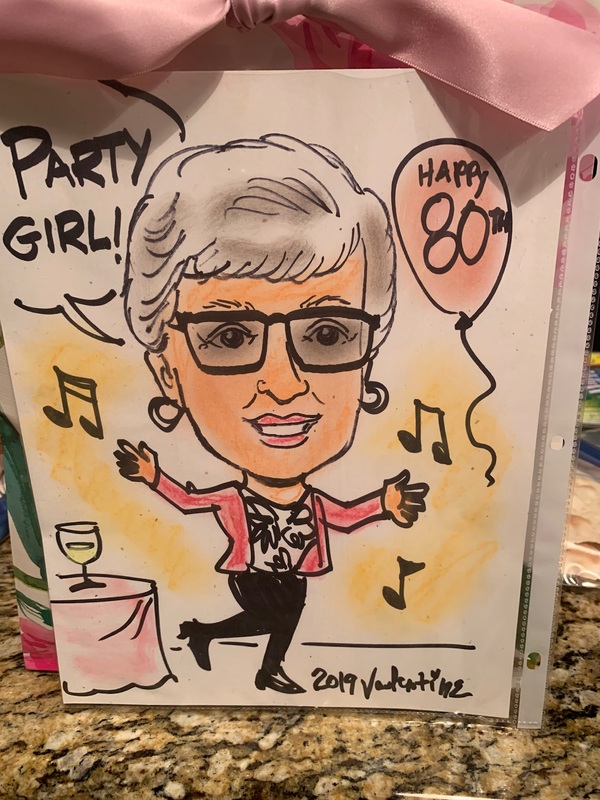 He has done caricatures at Bar/Bat Mitzvahs, weddings, corporate parties and picnics, birthdays, business promotions, trade shows, conventions, and many other types of events. 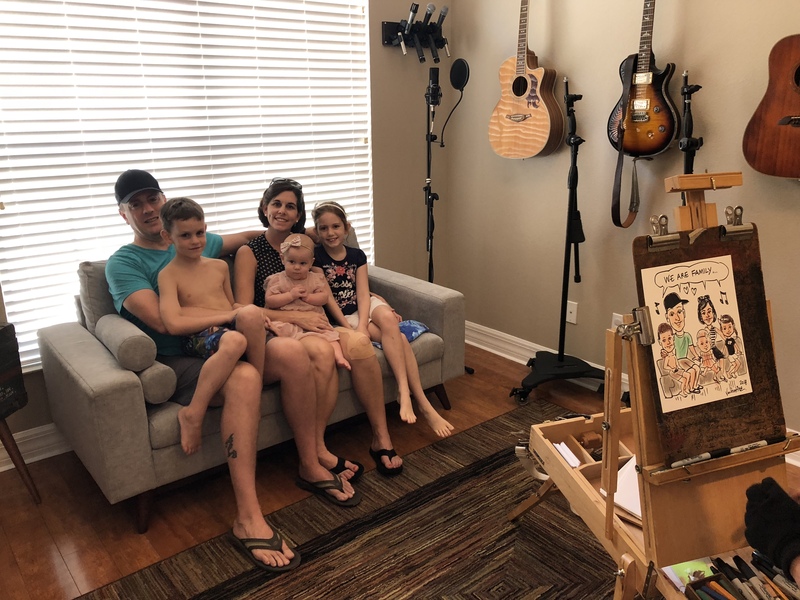 Mike's past clients have been thrilled with his ability to capture a great likeness, as well as adding the subject's favorite, hobby, sport, occupation, etc. in the drawing as well. Mike has worked throughout Connecticut, Westchester County, NY, New Jersey, as well as Massachusetts. Mike has also worked as a caricaturist, portrait artist, and silhouette artist at two of the Disney theme parks. Mike is also a book illustrator, and has done numerous children's books. He has also drawn for several comic book companies, including DC comics.